After a rather short night out on Pub Street and relaxing while watching Ancient Aliens, I attempted to get some sleep so I would be more than rested for day two at Angkor Thom. It was an early morning, waking at 4:15 am to ensure we made it out front to greet our driver at 5 am. Does anyone else struggle to sleep when you know you have to be up super early? 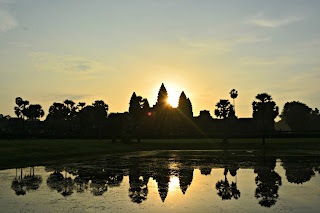 I was terrified I was going to oversleep, and we were going to miss out on experiencing the sunrise over Angkor Wats. A score to this one blonde chick for setting eight alarms and waking our booty's up on time! I wasn’t really sure why we needed to get there so early if sunrise wasn’t until around 6:45. But at 5 am there were already a ton of people trying to find the ideal spot to capture the perfect picture. Many of the people standing around swore that sunset at Angkor Wats was going to be better. The time of year we were there did not allow us to see the temple at sunset. By evening the sky was littered with clouds, and it was generally raining cats and dogs. And so, we waited...and waited...and waited for that magical moment when the sun would disburse all kinds of amazing colours across the sky over this ancient building. There was a small window where you could see various hues of pink in the sky but nothing like some of the other photos I’ve seen of Angkor Wats. Nonetheless, it was still breathtaking. After capture the iconic shot I needed, we headed into the temple to explore the ruins. We had spent a good chunk of the previous two days watching YouTube videos about Angkor Wats to learn as much as possible about the temple. Angkor Wats was large and would have been very overwhelming if we had not watched the videos. The night prior, we watched a video about the art galleries that line the halls. Each hallway told a specific story. As I’m not very good at deciphering directions, we had a fun time guess which gallery was which. 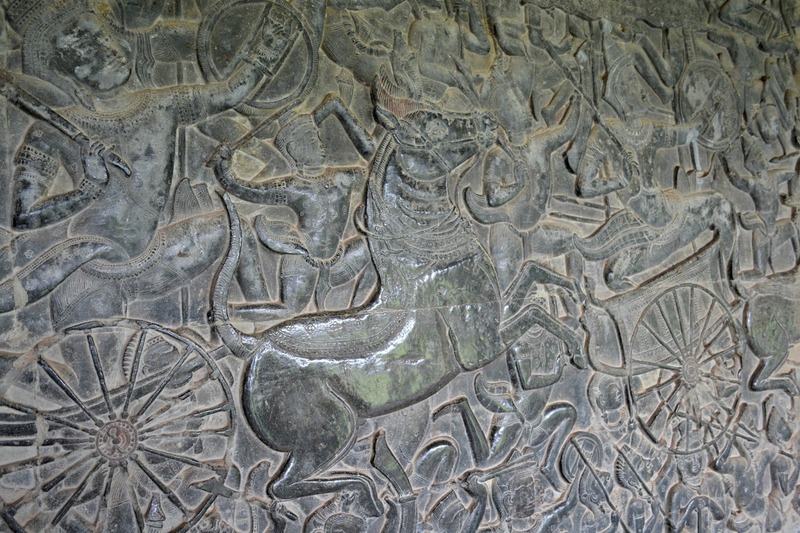 The galleries depicted stories of the gods fighting alongside the Khmer people, King Suryavarman II in battle, and other Buddhist carvings. 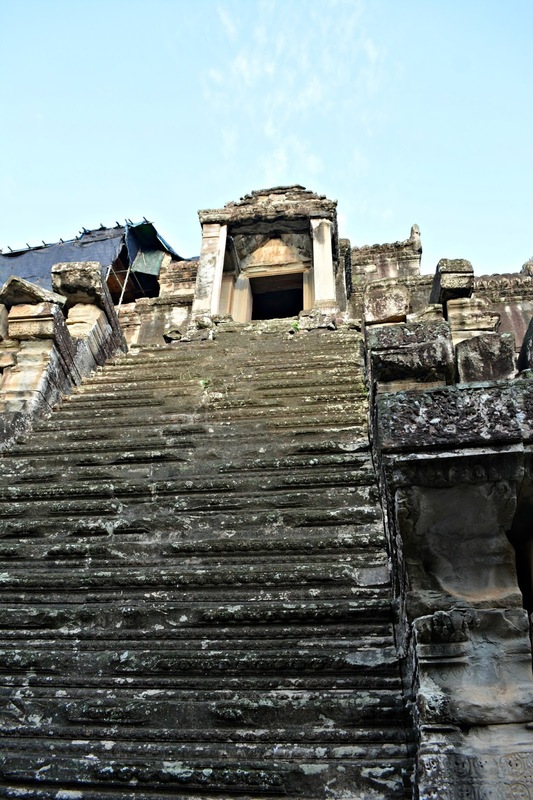 The steps leading up to the main temple were extremely steep. 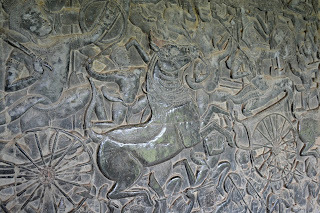 King Suryavarman II did this to reflect the hardships to the path of enlightenment. It is not easy to reach enlightenment so the steps to the main temple should not be an easy climb. Unfortunately, as it was a holy day, we were not able to enter the highest tower. 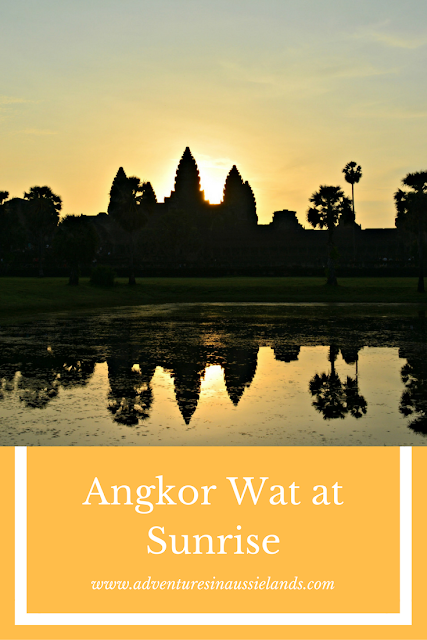 There is so much to see at Angkor Wat. In total, we spent nearly two hours exploring the various areas of the temple. I overheard a guide saying that one could easily spend 4 hours and still not get a chance to see everything. The later it got, the more people arrived at Angkor Wat. As it started to get pretty crowded and our bellies were starting to make heaps of noise, we decided to head off for some breakfast. 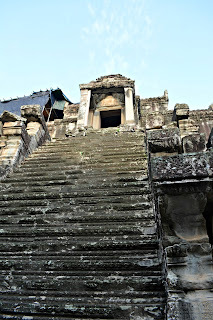 Because we had done all the research on the temple, it made Angkor Wat even more intriguing. I was able to get a deeper insight to what the carvings represented, just how large the temple was, and the work that was put into building it. While I wouldn’t necessarily recommend one of the guides that wait out the front, I would recommend doing some research on the temple before visiting. This way, you can have a deeper appreciation for the temple. 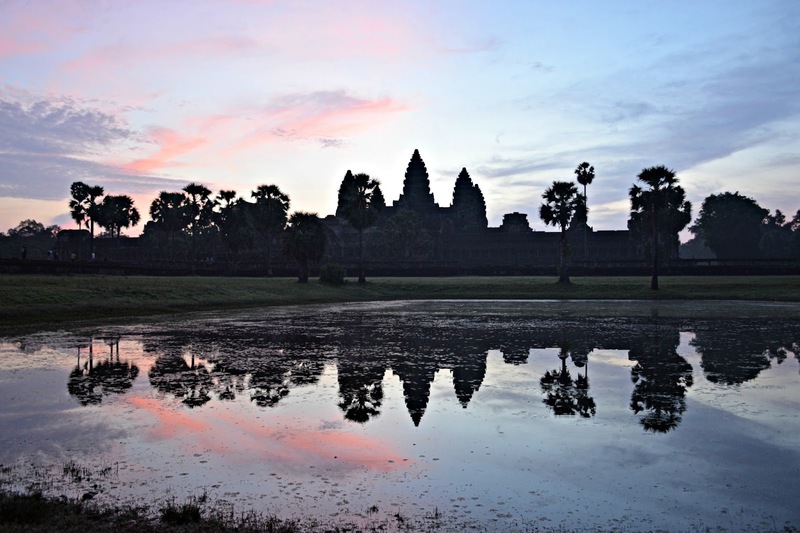 Have you ever visited Angkor Wat before? Share your experience in the comments below! Wow, this looks so beautiful! Isn't the show amazing?! You're going to have a blast in Cambodia! It truly is incredible. Cambodia is an amazing country! I highly recommend visiting. Getting up early to capture such amazing views is worth it. Your photographs are great. Being an Indian I have never spent 2 hours in a temple; this means that the temple must be really beautiful to visit. Thanks for sharing! Thank you very much! There was so much to see in this temple I could have easily stayed longer. The sunrise looks beautiful from your photos. It's always worth the early morning to catch such great views in the morning. I enjoyed the fact of the stairs in the temple being so steep and to signify the hardships of reaching enlightenment. Very interesting! 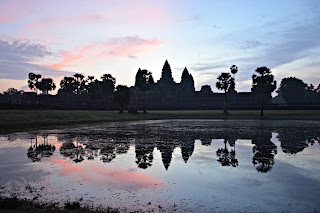 I loved Cambodia and visiting the temples, thats for sharing a great post and stunning captures. You're welcome. Cambodia is amazing! I can't wait to go back. 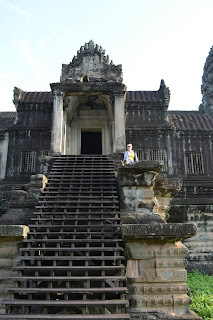 I loved Cambodia and the temples such a fascinating place with so much history and culture. I am planning to go back this year cannot wait. Loved your photo too. It is such an incredible place! I cannot wait to visit again. 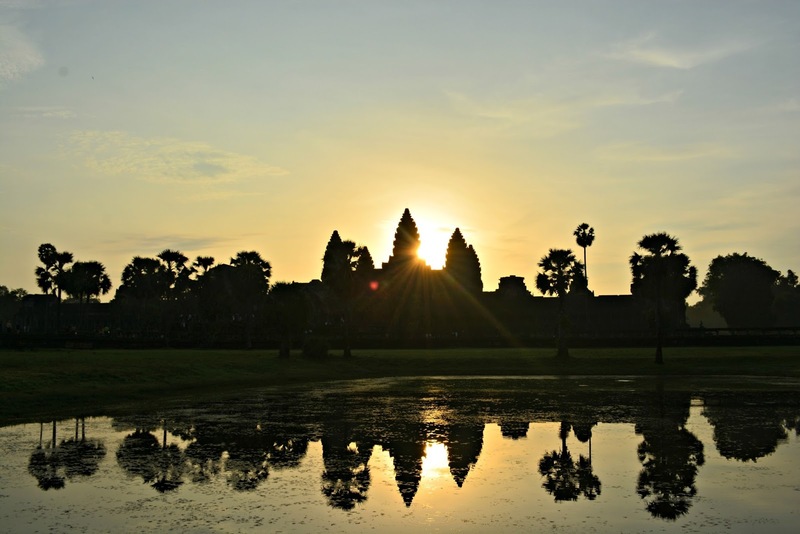 I will definitely keep an eye out for your next trip to Cambodia!